I am using WinSCP 4.1 (build 416). While downloading a file using SCP protocol, I figured out that speed limit can be changed for this particular download. So after trying this WinSCP reported following error. 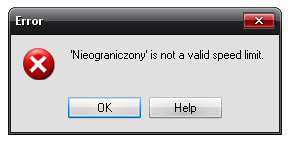 Using Polish Windows OS -> "Nieograniczony" is "Unlimited", it is the default choice. There were no "Unlimited" in the choice box, I've added "Unlimited" typing it by hand. After typing "Unlimited" it works fine. You have probably used Polish localization of WinSCP before and switched to English meanwhile. Could you please check if this bug reappears on other localizations? If this shows up after changing languages settings it's still a bug anyway. It's not very annoying bug as long as you can translate from your native language and write in english "unlimited" in the speed limit box. If you cannot translate, it's not possible to change speed limit back to unlimited. If it's possible please investigate this bug. I have added to documentation how to remove speed limit.